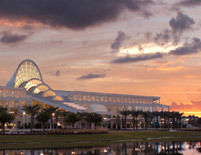 Perhaps more than any other facility, the Orange County Convention Center (OCCC) in Orlando, Florida, demonstrates the fusion of technology and design elements that make state-of-the-art convention centers possible. The sheer scale of the OCCC’s North/South Building project necessitated fresh thinking about how such an elaborate system could be controlled, and Lutron rose to the challenge with the implementation of its GRAFIK 7000 light control system throughout the facility. The Lutron solution allows the Center to execute conﬁguration changes with speed and simplicity anywhere in the building, or even remotely, from any telephone. 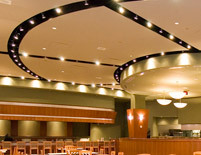 The Challenge: Provide an easy-to-use light control solution that integrates with state-of-the-art design and is ﬂexible enough to adapt to the daily changes at one of America’s largest convention centers. In the rapidly growing world of convention and exposition centers, bigger is usually better — for exhibitors, attendees, and local economies alike. The explosive rise in “big box” facilities across the U.S. and throughout the world attests to the boom in this business. Light control systems for these mega facilities both present a unique set of challenges, not only from the architectural and design standpoints, but also for the staff that must operate and maintain these centers through dozens or hundreds of different events each year. 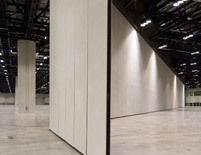 Comprised of two buildings connected by a covered pedestrian walkway, the Center offers 2.1 million square feet of exhibition space, and approximately 4.9 million additional square feet dedicated to meeting rooms, lobbies, and support space, making the OCCC the second largest convention center in the country. 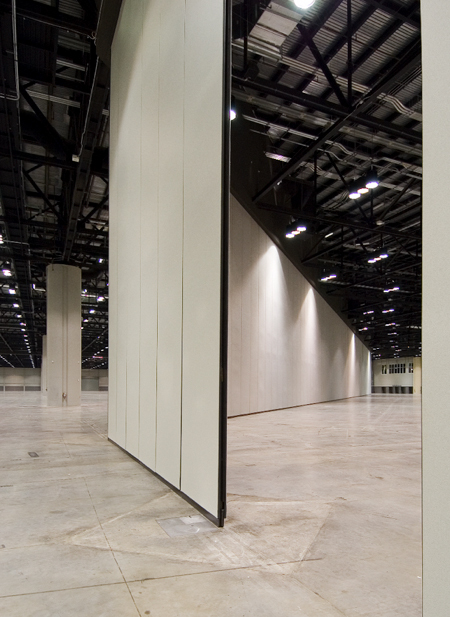 While able to house even the most demanding trade shows, the Center’s lighting is conﬁgurable through ten exhibit halls that can be set up as contiguous or discrete spaces though an array of automated partitions. 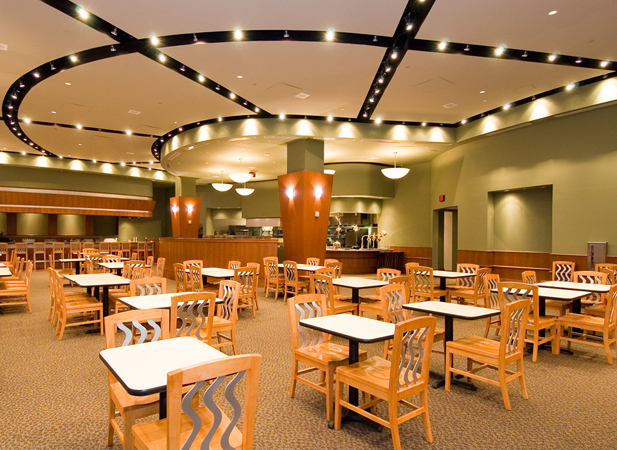 This allows the facility to quickly customize itself for more intimate events such as lectures, pageants, performances, and graduations, all of which can, and often do, run simultaneously. The challenge to design a lighting scheme with the versatility that OCCC’s new North/South Building required fell to Robert Laughlin and Associates of Winter Park, Florida, which designed a system that could provide optimum ﬂexibility for the center’s partitioning abilities, and would also utilize the abundant Florida sunshine to its best effect. The sheer scale of the project necessitated fresh thinking about how such an elaborate system could be controlled, and Lutron rose to the challenge with the implementation of its eLumen system throughout the new building. The Lutron solution allows the center to execute conﬁguration changes with speed and simplicity anywhere in the North/South Building, or even remotely, from any telephone. The Lutron light system has been tied via automation to various “typical” conﬁgurations that the facility uses, but manual control is also available at the touch of a button for on-the-ﬂy modiﬁcations. Using the customized graphical user interface, courtesy of the Lutron PictureIt software from the eLumen software suite, the center's operator can click on any ﬁxture in the room and accommodate any special lighting requests. Best of all, it’s possible to do all this remotely. “Our products have the Lutron patented Softswitch technology, which has been tested to over a million cycles, and increases the life of the relay.” The center has been so pleased with the reliability of these Lutron components that it is now looking to upgrade OCCC’s West Building to the new relays. Creating a “best of the best” convention center is a matter of collaboration between the visionaries that conceive it, the engineers that devise it and the technologies that empower it. 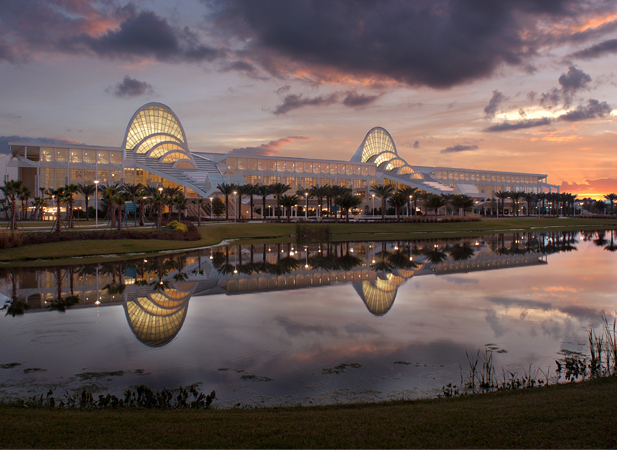 Lutron is proud to be an integral part of the Orange County Convention Center and all that it symbolizes for what is possible in the art of convention center design. GRAFIK 7000 Manage the lighting of multiple spaces from a single control. Fully scalable, GRAFIK 7000 can handle the most complex projects.